Abstract: The Istro-Romanians are one of Europe's smallest ethnic groups. They inhabit villages like: Šušnjevica (i.e. Sușnievița), Žejane (i.e. Jeiăni), Brdo (i.e. Bârdo) and Nova Vas (i.e. Noselo), in the central and northeastern corner of the Istria Peninsula, Croatia. Their dialect is currently included in the UNESCO Red Book of Endangered Languages as Seriously Endangered. Istro-Romanians are not accepted by the Croatian Constitution as a national minority. In the lack of any institutions to preserve their language and cultural heritage, the very existence of this ethnic group is threatened. In this paper I am presenting potential solutions for preserving the culture of Istro-Romanians. In this paper I present a study about one of Europe's smallest ethnic groups: the Istro-Romanians. They inhabit several villages from the North-Eastern corner of the Istria Peninsula, Croatia. Currently, the Istro-Romanians are to be found in two pockets. To the North of the Ćićarija Mountains, the village of Zejane (i.e. Jeiăni) is mostly inhabited by Istro-Romanians. To the South-Western side of Mount Učka (i.e. Monte Maggiore), there are several Istro-Romanian villages and hamlets surrounding the former shores of the now drained Lake Ćepić in which the Istro-Romanian language is still alive: Šušnjevica (i.e. Sușnievița), Brdo (i.e. Bârdo), Jasenovik (i.e. Sucodru), Kostrĉani (i.e. Costârcean), Letaj (i.e. Letai) and Nova Vas (i.e. Noselo). In the last decades of the XXth century, large numbers of Istro-Romanian inhabitants from the inland villages migrated towards the costal cities of Rjeka (it. Fiume), Opatja (it. Abbazia), Rovinj (it. Rovigno), Pula (it. Pola), Pazin (it. Pisino) etc. Furthermore, an important number of Istro-Romanians have migrated from their natal villages to foreign countries like United States, Australia, Canada, Italy and France. It resulted that there are more Istro-Romanian speakers in the Diaspora than in their original villages5. The Ćići/ Ciribiri – Designate the Istro-Romanians from and around the village of Žejane (i.e. Jeiăni). In my field trip of 2009 I have found that they use a specific expression for their dialect: "på jeiånski". The Vlahi – Represent the Istro-Romanians around Šušnjevica (i.e. Sușnievița), a village situated on the south side of Mt. Učka (i.e. Monte Maggiore)1, 5. This article is based on an ongoing team research project in which I participate as a member. Basically, I am presenting here some of the results of the first research stage from the summer of 2009. Several of the Istro-Romanian communities were studied: the villages of Šušnjevica (i.e. Sușnievița), Žejane (i.e. Jeiani), Brdo (i.e. Bârdo), Jasenovik (i.e. Sucodru), Letaj (i.e. Letai) and Nova Vas (i.e. Noselo). In this article I address several objectives. First, I examine the Istro-Romanians' past and current status, and the politics that address them; I begin by investigating the debates surrounding their origins, history and identity. Secondly, I continue by describing their present situation from anthropological and demographic points of view. Finally, I suggest a few solutions for preserving the culture of Istro-Romanians and I also approach the way Istro-Romanians are supported by the Diaspora. In order to emphasize the Istro-Romanians current status, I am presenting a map (Figure 1) that I have developed by corroborating data from Sextil Pușcariu's map7, maps available on several websites created by Istro-Romanians8-9, maps based on recent empiric data2-5 and also on the information that I was able to gather regarding the Istro-Romanian communities from Istria in 2009. The first reference to a romance speaking population in the Istria Peninsula in Medieval times was made in 940 A.D. by the Byzantine (Eastern Roman) emperor Constantin VII in his Πρὸς τὸν ἴδιον σἱὸν Ρωμανόν, conventionally called De Administrando Imperio (engl. On the governance of the Empire). He mentions that there were Latin-speakers in the Istria Peninsula who called themselves Romans but did not come from Rome. Afterwards, in the XIIth century, there was a mention of an Istrian leader called Radul, a name that is very frequent in Romania in our days. Both of these references are used to fuel several debates regarding the Istro-Romanians' origins and identity8. There are several perspectives concerning the Istro-Romanians' origin. Some historians, anthropologists and linguists consider that the Istro-Romanians migrated from Transylvania to their present region between 1000–1400 A.D. Other linguists would suggest a local origin of Istro-Romanians, based either on an ancient Roman origin, or in a possible correlation with the Black Romanians (i.e. Morovlachi or Morlaci/ Morlachs), which were a very distinct ethnic group that settled in great numbers in Dalmatia at the turn of the second millennium5. The presence of rhotacism in the case of specific words found both in Țara Moților (i.e Moților County) and in the Istro-Romanian dialect. The rhotacism represents the transformation of some consonants into r, especially of the consonant n from the middle syllables of various words. For example the Daco-Romanian word bine (engl. good) becomes bire in Istro-Romanian3. The presence of Istro-Romanian popular stories regarding their arrival in the Istria Peninsula during medieval times. For example Pepo G., the main research informant from the village of Šušnjevica (i.e. Sușnievița), stated during our second interview, that according to local legends, there were seven caravans that arrived during Medieval times in Istria, from Transylvania. Six of them passed through the mountain passes of Mount Učka (i.e. Monte Maggiore) and one remained in the north. It is also necessary to mention several other perspectives regarding the Istro-Romanians' origin. For example, if I approach the thesis according to which the Morlachs/ Morlaci were the ancestors of Istro-Romanians, the first documents in which they are mentioned appeared as early as 1160-1170. The Morlachs or Morlaci were mentioned as being the western branch of the Vlachs that populated Western Serbia, Sirmium, Croatia and Dalmatia5. In the XIVth century, Giovanni Frangipani (Ivan Frankapan) brings to his estate Morlachs/Morlaci from the island of Veglia6. In the second half of the XV century a plague epidemic decimated the population. As a result, the Republic of Venice settled Morlachs/Morlaci in the region around Castelnuovo. In the period of 1510-1599 the Morlachs/ Morlaci established more than 30 settlements of various sizes all over Istria5. Another similar theory approaches a group that was either considered as a part of the Morlachs/Morlaci, or related with them. They were named Cici and some sources consider them Istro-Romanians7. The first reference to this group is made in 1329, when in Pinguente a certain Pasculul Chichio is mentioned5, 9. Around the city of Trieste the Cici are explicitly mentioned for the first time in 1513. By 1523 they were officially referred to as cicerani or ciceliani by the Italian and the Austrian Chancelleries, and the region where they were established changed its name from Carsia to Ciceria. In 1698 Fra Ireneo della Croce (1625-1713) mentions in his Historia antica, e moderna sacra, e profana, della cittá di Trieste (i.e The Ancient and Modern, Sacred and Profane History of the City of Trieste) a people who "beside the slavic idiom common for all the Karst area, speak also their own and particular language, which is similar to the Wallachian and contains many different Latin words"8. Della Croce was actually referring to the language spoken by the Istro-Romanians who, during the XVIIth century, inhabited vast areas of the Istria Peninsula, up to Trieste. Another theory states that the Istro-Romanians are actually direct descendants of the Roman colonists established in the Istria Peninsula and along the Dalmatian Coast during the time when the Roman Republic, and later the Empire, transformed these lands into Roman provinces. This theory relates the Istro-Romanian dialect with the now extinct Dalmatian language, more specifically with the Vegliot dialect8-9. However, this theory has few arguments in its favour, and it doesn't explain sufficiently the differences between the Istro-Romanian dialect and the few thousand Vegliot words that have been recorded at the end of the XIXth century. All these theories and the various arguments that I've mentioned here have generated debates regarding the Istro-Romanians origins. Nevertheless, they contribute to outlining a picture about the Istro-Romanians in Medieval times. Throughout the XVIIth and XVIIIth centuries, the Istro-Romanian communities were slowly diminishing. This trend was accentuated in the XIXth and the XXth century. The first modern demographic data gathered starting from the middle of the XIXth century demonstrates this tendency. Thus, by the middle of the XIXth century, the most optimistic accounts stated that there were 6000 Istro-Romanians and/or Istro-Romanian speakers, while the most pessimistic stated that there were around 1555 Istro-Romanians. More specifically, between 1847 and 1899 the number of Istro-Romanians diminished from 6000 persons to 36007. At the beginning of the XXth century there were around 3500 Istro-Romanians. At the official Italian census from 1921 there were only 1644 Istro-Romanians. The real size of the Istro-Romanian population was hard to assess due to the fact that few of them declared themselves as being Istro-Romanians. This fact became obvious after the Second World War, when in Žejane (i.e. Jeiăni) only 8 persons declared themselves as being Istro-Romanians, in Jasenovik (i.e. Sucodru) – 19, in Brdo (i.e. Bârdo) and Kostrĉani (i.e. Costârcean) – 443, and in Šušnjevica (i.e. Sușnievița) – 83. The explanation for this might reside in the social and political changes that took place after World War II. Between 1918 and 1947 the Istria Peninsula was a part of Italy. During this period the Istro-Romanians benefited from certain administrative and educational advantages. Thus, all the Istro-Romanian settlements situated to the South of Mount Učka (i.e. Monte Maggiore) were grouped into a single administrative structure, the Commune of Valdarsa, which had its administrative centre in Sușnievița5. Figure 1 presents the gradual reduction of the areas that were inhabited by Istro-Romanians in the XIXth century in comparison with the areas inhabited by them at the beginning of the XXIst century. It should be noted, however, that the difference between an Istro-Romanian and an Istro-Romanian speaker (i.e. a person that regardless of its ethnic identity can speak the Istro-Romanian dialect is a source of bias that can't be fully corrected. The first writings about the Istro-Romanian speakers were exclusively presenting the existence of a population speaking this dialect, with no remarks regarding their ethnic identity. For this study I am considering an Istro-Romanian speaker as being a category larger than that of Istro-Romanian, who as a category is included in the former (i.e. as a species would be in a genus). Therefore, Figure 1 has only the role of emphasizing how in an interval of about 200 years the number of Istro-Romanian speakers and/or Istro-Romanians has been reduced dramatically. Relevant for the history of the Istro-Romanians is the fact that during one of his field studies in 1893 the Romanian academician Teodor Burada met Andrei Glavina in Istria, brought him to Romania and later supported Glavina during his education in Iași and Blaj. Andrei Glavina became a teacher in his home village of Sușnievița, where he founded the first and only school in the Istro-Romanian language in 1919. The school was called Împăratul Traian (i.e. Emperor Trajan) and had in its first year 180 students8-9. The publication in 1905 of the Calendar lu Rumen din Istria (i.e. The Calendar of the Romanians of Istria) which included a collection of Istro-Romanian proverbs and stories that helped in preserving a vital part of the Istro-Romanians' culture. He was elected as the first Mayor of the Commune di Valdarsa. In his capacity as a Mayor he managed to build larger premises for the school and roads between Sușnievița and Pazin (i.e. Pisino). He also had a project which included the land reclamation of the Cepić Lake and the reactivation of a large coal mine that employed almost 7000 people5, 8-9. After World War II the number of Istro-Romanians that inhabited the various settlements from Istria decreased dramatically. In 1961 there were only 450 Istro-Romanian speakers in Jeiăni, in Letai – 50, in Sușnievița – 150, in Noselo – 190, Sucodru – 60 and in Bârdo – 230. In total there were 1140 persons that either considered themselves Istro-Romanians or that spoke the Istro-Romanian dialect4. In 1991 810 persons from Istria declared themselves Istro-Romanians and 22 Morlachs. In 2007 a group of researchers from Universitatea de Vest Timișoara (i.e The West University of Timișoara) claimed to find in the village of Jeiani around 136 to 152 Istro-Romanian speakers and 80 speakers in Sușnievița, Sucodru, Noselo, Costârcean, Zancovți, Miheli, Draga and Bârdo5. Between 2007 and 2009 the number of Istro-Romanian speakers from Istria slightly decreased due to three deaths. It should also be taken into consideration the fact that the majority of Istro-Romanian speakers from the Istria Peninsula are at least 60 years old. This means that in the next 20 or 30 years a dramatic decrease of their number should be expected. At present the Istro-Romanian speakers' communities are endangered more than ever. Without coherent action, a culture whose history spreads over 700 years will die in the next few decades. The relative isolation of the Istro-Romanian communities. The oral character of their legacy2. The flexibility that was determined by the scarcity of resources to which their culture was forced to adapt. This is a common feature to many other cultures found in various mountainous regions. The Istro-Romanian is considered to be either a dialect of Romanian or a language that belongs to the Eastern Romance language group3. In the UNESCO Red Book of Endangered Languages (1993) the Istro-Romanian is listed at the position 21, as being "seriously endangered". Also, the number of Istro-Romanian speakers was estimated to be no more than 50010. 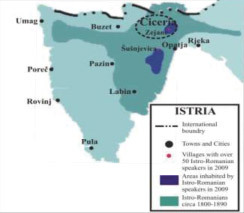 At the 2001 Croatian census however, only 137 inhabitants of Istria declared Istro-Romanian as their mother language. In 2002, according to Filipi, there were about 250 Istrian inhabitants that were still speaking Istro-Romanian3. During an interview in 2009, Pepo G. estimated that in Istria there were around 80 fluent Istro-Romanian speakers and 100 to 150 people that still understood Istro-Romanian and had various degrees of speaking proficiency. The Istro-Romanian art is dominated by songs and dance. This is particularly true in the case of their traditional male dance group called the Žejanski Zvončari (i.e. The Zejanan Bellringers). The group was officially constituted in 1997 and performs traditional songs and dances in the Istro-Romanian Language. The folk literature is to a certain degree still active. Thus, several songs have specific Istro-Romanian words like Când am tire (i.e. WhenI asked you), Mes-am ocha și coľa (i.e. I went around), Oi ľepure nu juca (i.e. Don't dance, rabbit), Fina feta (i.e. A nice girl) etc. The Istro-Romanians had in the past many proverbs. Some of them were collected by Andrei Glavina in Jeiăni and were published afterwards by Iosif Popovici in the book entitled Dialectele române din Istria (i.e. The Romanian Dialects in Istria)6. Last year, I cross-referenced these proverbs with a few found in Sușnievița and Jeiăni in order to see how many are still known by the local Istro-Romanians. In Table 1 I am presenting several examples of such proverbs found8. Nu ie cârne far de ose. There is no meat without bones. Lu Domnu și lu Drîcu nu se pote sluji o vote. You cannot serve God and the Devil at the same time. Nuntă făr de ărs și mortă făr de plâns nu se pote. There isn’t wedding without laughter and death without crying. Mora bure mâcina și bovan. The good mill can [even] grind rocks. Din cala lu omu bet și Domnu se dâie la o bande. Even God avoids the drunk. These proverbs, song texts and traditional stories have an important educational value, beside their artistic significance. The main quality that is treasured in these stories is cleverness, and the ability to adapt to various conditions. As a result, I argue that one of the hypotheses that should be taken into consideration when attempting to explain the survival of the Istro-Romanian dialect in its current form can reside in the educational value of these traditional texts. The Istro-Romanian Diaspora, especially the communities from the United States and Canada have increased the level of awareness vis-à-vis their culture with the help of the Web. Several websites presenting the Istro-Romanians' culture and history are active on several servers from Europe and the United Stated. Most notably, the site istro-romanian.com created under the supervision of Marisa Ciceran, has been active and updated since 19998. The Diaspora's contribution is also significant in preserving various important buildings from the Istro-Romanian villages. For example, in the hamlet of Bârdo, the clock tower that is a trademark for the entire area has been repaired and upgraded with funds coming from the Diaspora. Also, in the village of Jeiăni, a project consisting in the construction of a museum presenting the Istro-Romanians' culture is in its initial stages. The Istro-Romanians as a distinct ethnic group is threatened with disappearance at the beginning of the 21st century. As the numbers of Istro-Romanian speakers is dwindling, it becomes evident that a culture transmitted almost exclusively by speech can be saved only with a concentrated effort. This effort should be based first and foremost on an educational approach and not on a political one. A very inexpensive and also efficient solution might consist in establishing a summer school in which the Istro-Romanian language and traditions could be taught. Also, Diaspora's efforts could be corroborated with researchers' efforts to document and preserve the Istro-Romanians' unique culture, by developing institutions such as a museum that could represent a focal point for the remaining Istro-Romanian communities. Also, their legacy could be preserved if specialised NGO's, such as Decebal from Italy, would successfully attempt to constitute a buffer between the local communities and various political actors that might have a role in conserving the Istro-Romanians' legacy. The article contains some of the results obtained in the first stage of a research project in which I am a member, entitled Istro-românii: studiu al dinamicii identității culturale și a mediului - Contract nr. 885/2009 (i.e. Istro-Romanians: A Study of the Cultural Identity and Environment Dynamics). This project is coordinated by Georgeta Mărghescu, P.h.D. I would like also to acknowledge the vital support offered by Professor Gheorghiță Geană. Ramona Potoroacă, Ph.D., from the Astra Museum, Sibiu played an important role in offering the results of a similar research stage coordinated by her in 2008. A broader version of this paper was presented at the EASA 2010 Biennial Conference entitled Crisis and Imagination, in the Workshop W065 Stateless ethnic groups in Europe: problems and perspectives. This presentation was possible due to a Wenner-Gren Foundation Grant. Baron, O.: Oralitate și multilingvism. Câteva considerații asupra culturii istro-române (Orality and Multilinquism. A Few Considerations Regarding the Istro-Romanian Culture). In: Istroromânii – Repere cultural-istorice (Istro-Romanians – Cultural and Historic Markers). Potoroacă R. (ed.). Astra Museum, Sibiu. 2008, pp. 113-121. Deleanu, V.: Observații etnografice privind istroromânii (Ethnographical Observations Regarding The Istro-Romanians). In: Istroromânii – Repere cultural-istorice (Istro-Romanians – Cultural and Historic Markers). Potoroacă R. (ed.). Astra Museum, Sibiu. 2008, pp. 103-113. Filipi, G.: Istrorumunjski lingvistički atlas / Atlasul lingvistic istroromân / Atlante Linguistico Istrorumeno (The Istro-Romanian Linquistic Atlas). Pula. Znanstvena udruga Mediteran, 2002. Flora, R.: Micul atlas lingvistic al graiurilor istro-române (Small Linguistic Atlas of the Istro-Romanian Speeches). București. Institutul de Lingvistică "Iorgu Iordan – Al. Rosseti" al Academiei Române, 2003. Miclăuș, L.: Evoluția istro-românilor din perspectivă demografică (The Istro-Romanians' Evolution from an Ethnographical Perspective). In: Istroromânii – Repere cultural-istorice (Istro-Romanians – Cultural and Historic Markers). Potoroacă R. (ed.). Astra Museum, Sibiu. 2008, pp. 35-42. Popovici, J.: Dialecte române. Dialectele române din Istria, Texte și glosar, Volumul IX, Partea a 2a (The Romanian Dialects. The Romanian Dialects from Istria, Texts and Glosary, Volume IX, Second Part). Halle. Editura Autorului A.D.S., 1909. Pușcariu, S. et al. : Studii istroromâne, vol. II, Introducere, gramatică, caracterizarea dialectului istroromân (Istro-Romanian Studies, Volume II, Introduction, Grammar, the Caracterization of the Istro-Romanian Dialect) București. Cultura Națională, 1926. Romanian People of Istria. Available at: http://www.istro-romanian.com. Accessed: 17-08-2009. The Istro-Romanians in Croatia. Available at: http://www.istro-romanian.net. Accessed: 17-08-2009. Salminen T: UNESCO Red Book on Endangered Languages. Available at: http://www.helsinki.fi/~tasalmin/europe_index.html. Acessed: 12-09-2010.